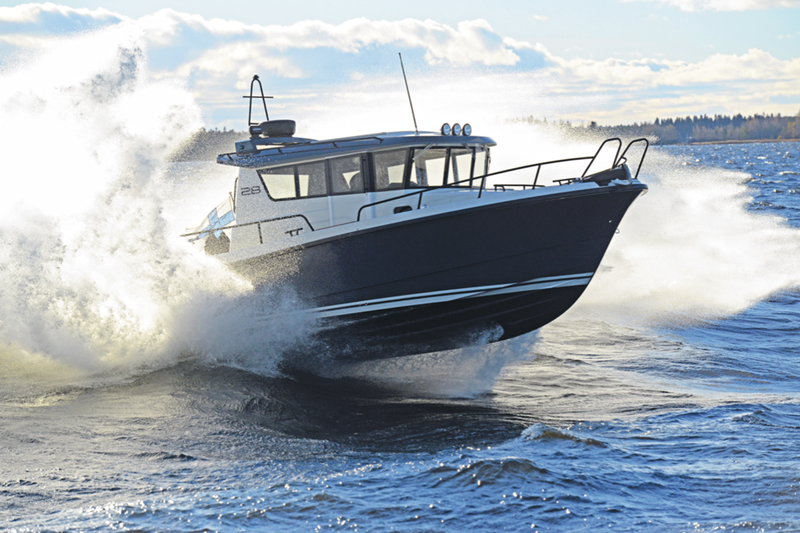 SARGO is the new-brand name for the Finnish boatbuilder formerly known as Minor Offshore. The name reflects the builder’s family name, Sarin, and Go—as in these boats are ready to go anywhere. 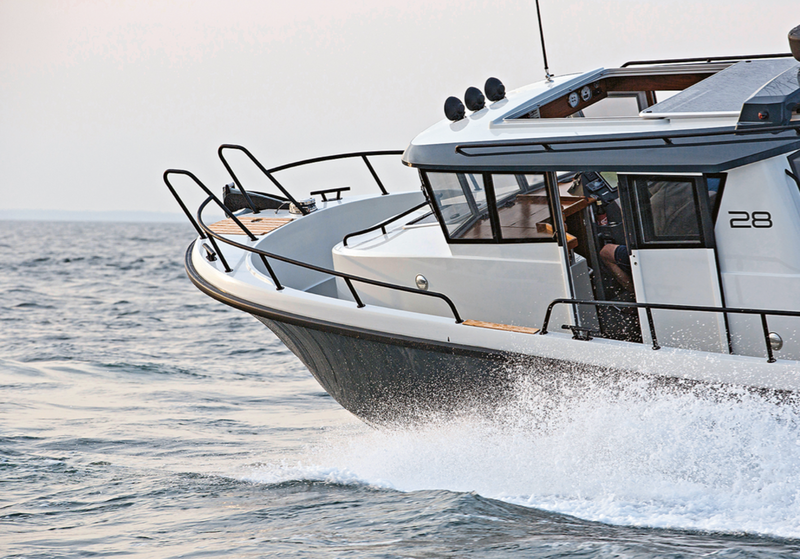 The SARGO 28 is an all-weather compact cruiser built in Finland to CE Category B standards with a solid build, stable ride and tough sporty looks. The test boat had a single Volvo Penta D4 Duoprop diesel rated at 260horsepower. A single D6 rated at 370 horsepower or twins at 175–220horsepower are available as options. 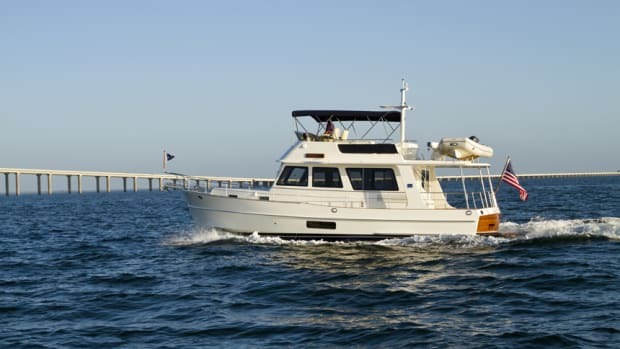 The standard configuration is plenty and scoots the boat along at 27 knots with a load of four adults, 3/4 tank of fuel and half a tank of water aboard. The entire afterdeck raises to provide generous access to all sides of the engine, as well as the other mechanical equipment, including battery switches, which can be controlled from the helm with electro-mechanical relays. Built to CE category B, there are few things the SARGO can&apos;t handle. While under way, we maintained a pleasant conversation during a very smooth ride, and it was only when I looked down at the chart plotter that I realized we were loping along at 27 knots… it felt like 10. Amazingly, the ride was quieter with the sunroof open, perhaps due to less reverberation from the D4 just below and abaft the pilothouse. 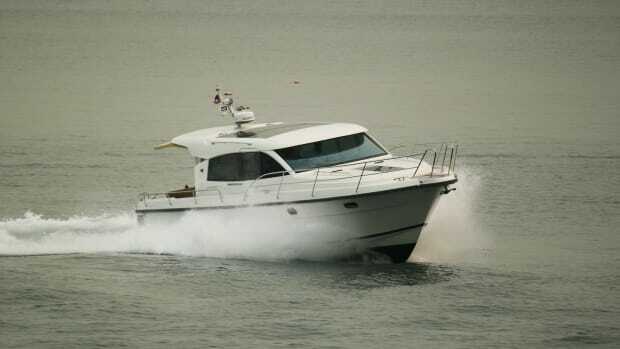 The handling is well mannered, with a few degrees of bow rise when the boat came on to plane, adjustable using a combination of the automatic trim tabs and drive trim. Throwing the wheel hard over at nearly 30 knots leaned us into a tight turn, yet the SARGO 28 maintained its composure. Sea conditions were flat calm, but we found a wake or two to play with, and managed to get the boat airborne crossing one at 32 knots. Pulling the throttles back to idle gently settled the boat into displacement mode. 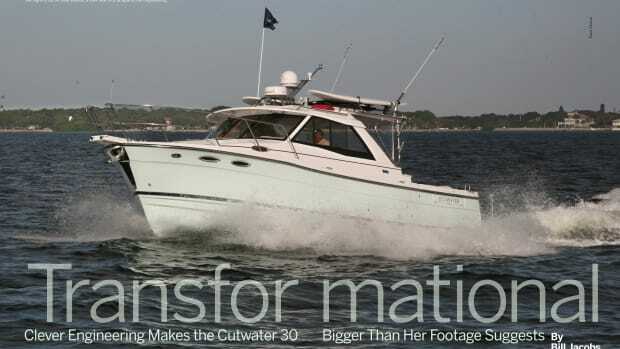 Close-quarters maneuverability is fantastic with the powerful bow thruster and stern drive. The Scandinavian design is evident everywhere on this boat as a combination of outstanding ergonomics and a clean, modern look. Considerable thought has been given to maximizing the use of space and making all of the equipment usable. Let’s start with the helm, accessed from the starboard pilothouse door. The steering console offers a tournament-style wheel with knob and a bolster on the seat for piloting from the standing position. Flip down the seat bolster, unlock the console and tilt it to a 45-degree angle, and you have an excellent seated position in a comfortable bucket seat with a perfectly positioned footrest. The line of sight from the helm is outstanding thanks to narrow mullions supporting the windshield, full side windows and a window through the after bulkhead. Compact yet efficient and comfortable is the name of the game here. 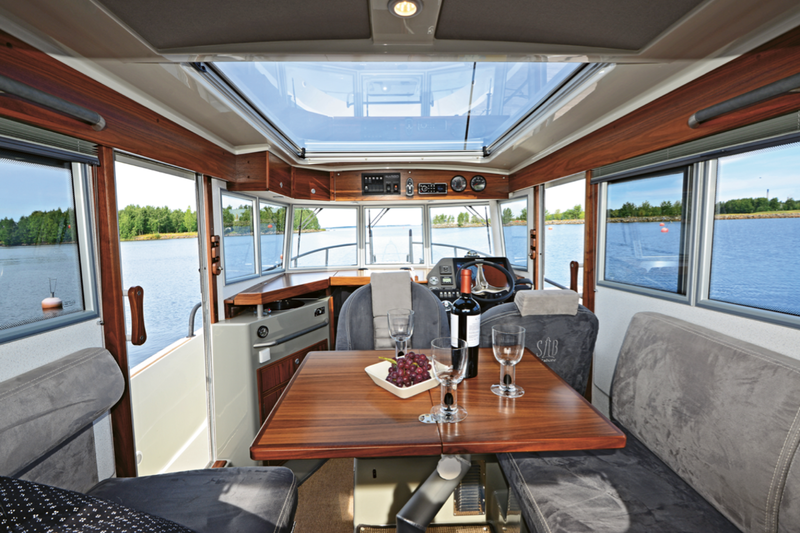 Beside the helm is a companion seat, accessed from the portside full-height pilothouse door, which can swivel back to face the U-shaped settee and articulated folding table, which can comfortably accommodate four adults for dining. Above is the huge panoramic sunroof. To open, simply rotate the forward grabrail, which unlocks and slightly raises the glass, and pull back. 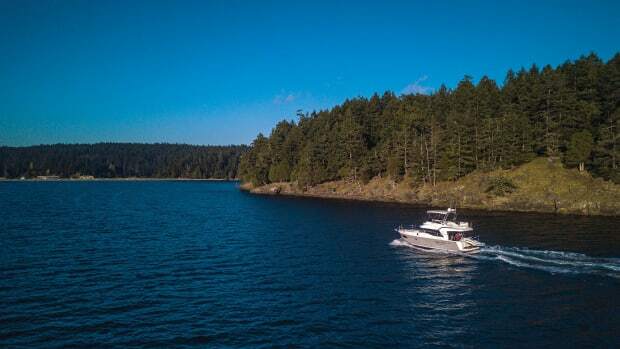 Forward and to port is a section of the wood dash, which, when raised with a gas strut assist, reveals a mini galley with a sink and small combination diesel cooktop/heater. SARGO Vitals from the manufacturer. On the centerline, is a companionway leading a couple of steps down to a full-size berth forward and a full-height wet head to starboard. A second cabin is neatly built into the space aft under the settee, with sleeping room for two. Adults might find this space a bit claustrophobic, but it is an excellent kids’ cave. Rugged is the word that comes to mind here. High freeboard, beefy rails and handholds everywhere make this a very safe deck to move around on in almost any sea conditions. I appreciated the large cleats placed forward, amidships and aft. Hull and deck are solid hand-laid fiberglass. Some parts of the superstructure (e.g., roof, radar arch) are cored to save weight. 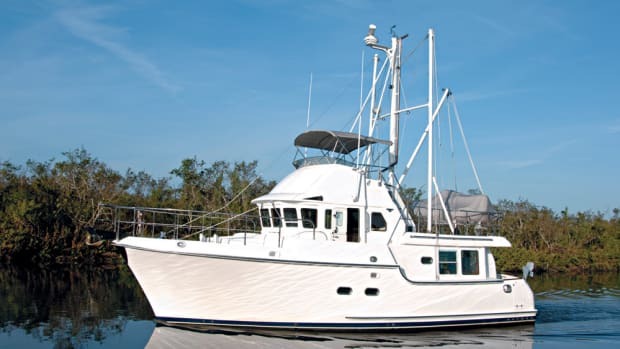 Whether the mission is fishing or cruising, you would be hard-pressed to find a better built, better designed cruiser in this size and price range. Explorer Package (on the test boat): $9,000. Includes matte black powder-coated rails and clears with matching radome and antennae, bonded windows, walnut interior, leather-clad brushed aluminum handholds, gray Nextel (non-glare) console, snap-in carpet over teak-and-holly flooring, Oceanair blinds, and matching black analog instruments.